Babylon alumna Mai Masri's début feature screens as part of the LFF First Feature Competition on 15th and 18th October. HOW PRODUCERS READ SCRIPTS - Q&A session with producer Damian Jones, DJ Films (5pm, European Pavilion,International Village). EVERYDAY REBELLION - introduction and Q&A with writer-producer Arash T. Riahi, Goldengirls Productions (6.30 pm, Institut für Wissenschaft und Kunst, Vienna). The 6th edition of BABYLON EUROPE, funded by the Creative Skillset Film Skills Fund and the Vienna Film Fund, held its final feature film development workshop of the year in London from 18-21 October, culminating in a panel discussion and pitching session about ways forward for new talent in independent film on 21st October at 10.30 (NFT3, BFI South Bank). Panellists: David Thompson (MD, Origin Pictures), Leslee Udwin (MD/Producer,Assassin Films), Natasha Dack (MD/Producer, Tigerlily Films), Dominic Buchanan (Head of Film, Stink), Soledad Gatti-Pascual (Producer, The Bureau), Patrick Campbell (Director of Programming, OH TV). 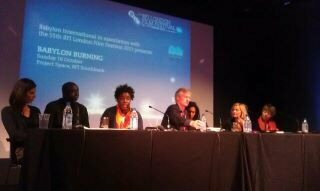 The panel was chaired by Gareth Jones of Scenario Films. BABYLON celebrated its 5th anniversary in October 2011 with a public debate on film diversity as part of the 55th BFI London Film Festival. Hosted for the first time by the LFF's industry programme, Babylon opened proceedings with a vigorous debate on the state of diversity in independent European film on 16th October (Project Space, BFI South Bank), with panel contributions from an eclectic group of producers, academics and journalists. Panellists: Daniela Berghahn (Professor of Film Studies, Department of Media Arts, Royal Holloway), Claire Frachon (French journalist and Author on Diversity in the European Media), Nadine Marsh-Edwards (Producer, Board Member Film London), Nadia Denton (Author, The Black British Filmmaker's Guide to Success), Tony Dennis (Producer, Author and Screenwriter), Barbara Mutschler (Producer, ScriptHouse, Babylon International). The panel was chaired by Gareth Jones of Scenario Films. The call for project submissions is now open for the annual programme bringing together European and African filmmakers to develop their feature film projects across 2 continents. 11 projects have now been selected to take part in this year's feature film development workshop. Details to be confirmed shortly. 10 projects based on culturally diverse themes were shortlisted to take part in Diverse Geschichten a major workshop led by Witcraft's Ursula Wolschlager and Robert Buchschwenter. 4 projects will be selected to participate in the Babylon Europe Programme 2011. Dutch candidates had the opportunity to pitch their projects and receive input and comment from script consultants, in a one-day workshop run by Mira Media, Utrecht. 4 projects will be selected to participate in the Babylon Europe Programme 2011. Film writer, director and producer Mitko Panov has been invited to give a materclass during which he will speak about the process behind his short film WITH RAISED HANDS (1991 Palme d'Or at Cannes), his documentary COMRADES and his feature length THE WAR IS OVER. During the masterclass issues around memory, identity and the consequences of war will be discussed and Panov will talk about how he has constructed narratives around these themes through his work. Masterclass: 15:00-17:00 � McDonald Institute for Archaeological Research, Seminar Room, Downing Site. Special Preview and Q&A : 18:00-20:00 � Cambridge Arts Picturehouse. For the film preview please book tickets directly from the Arts Picturehouse (www.picturehouses.co.uk/cinema_home_date.aspx?venueId=camb). Babylon in Berlin New workshop. Media and Cultural Diversity - Where do we need to go? Panos Paris Institute Debate at the University of Westminster. Amiens Film Festival, FADS jury (international screenplay development bursary). Babylon Pre-selection workshop in Amsterdam, in co-production with Mira Media.